This bracelet was sold at the side of Route 66 in New Mexico by the Bell Trading Co. The Michelsons, the same as Fred Harvey, founded their company to sell Native American jewelry. Unlike the jewelry the Navajos made for themselves, the Bell and Harvey jewelry was often machine-made. But Native Americans were hired. Bell started in 1932 and continued until 1972. Then the name was changed to Sunbell. 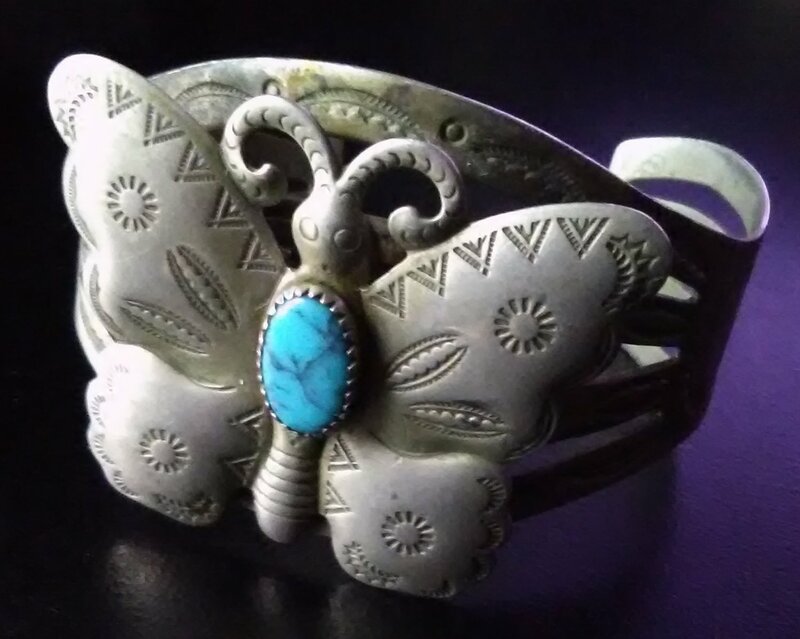 This cuff bracelet has the bell mark surrounded by "Nickel Silver". I believe this is the mark that was used in the 1930's through the 1950's. Please note the turquoise is not real turquoise and nickel silver is not real silver. The bracelet is still historic and lovely. Vintage Handmade Circuit Board Key chain All old circuits and old parts. Thanks! VINTAGE BOOKS OF LOVE "FOOTPRINTS IN THE SAND"